If you could manage numerous events, coordinate silent auction items, and communicate with donors all directly from a single location, what opportunities would it create for your organization? 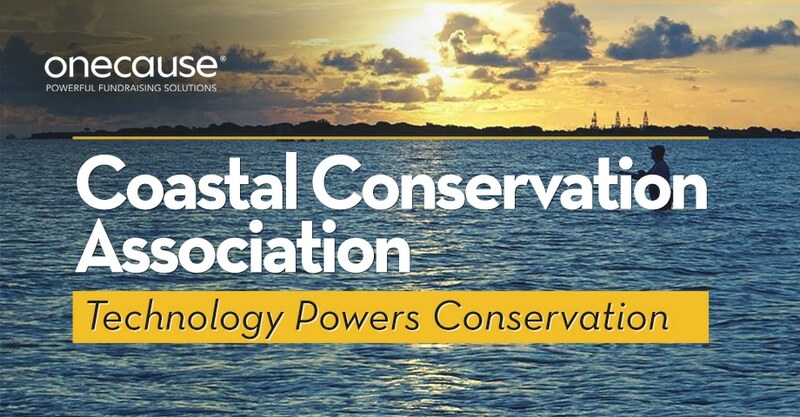 Through habitat restoration projects, water quality initiatives and fisheries advocacy, Coastal Conservation Asociation (CCA) Florida works with its over 18,000 members including recreational anglers and outdoor enthusiasts to conserve and enhance marine resources and coastal environments. Miriam Askin, an event coordinator for CCA, helps to plan more than 55 events every year for chapters across the state, which include silent and live auctions, all to raise money for CCA initiatives. A client of multiple years, CCA uses OneCause’s software to conduct their events, and will be the first to tell you, change is good. “We were a bit nervous to make a change from paper bids to mobile bidding because our demographic trends older, with our typical supporters in their mid 50s,” said Askin, who initially allowed chapter event committees to decide whether or not they wanted to use OneCause. “We tried it at an event just to warm people up to it, and it was a positive experience- people really enjoyed it, and we found that events using OneCause were overwhelmingly successful,” said Miriam, recalling her first few events with OneCause. Any guests who were hesitant about mobile bidding were given a quick tutorial. “They were thrilled, I mean, it was so user friendly,” said Askin. What’s more, contrary to her initial concern, supporters using the BidPal mobile bidding DIY software seemed to socialize and network more during events because they would receive a text message when they were outbid on an item. “The energy in the room is not as dynamic when guests have to keep an eye on paper bid sheets,” explained Askin. Since the beginning of their partnership with OneCause, CCA has increased revenue raised on their silent auction items by as much as 150 percent. With multiple events happening all over the state of Florida, Askin will tell you the most helpful part about using OneCause is the ability for her to have her hand in every event all the time, from anywhere. “If there’s a high value item that’s not getting many bids, I’m able to send a text message to all the guests at the event from my home to draw their attention to that item,” said Askin. She also can send a text message to an individual donor during an event if the guest is using the OneCause system. This came in very handy during one event when a guest had bid on earrings and she could let him know that there was another item containing a matching necklace that didn’t have any bids. With OneCause’s Giving Center and online capabilities, Askin is able to view donations and bids and communicate with guests at multiple events on the same evening. Some of her staff have even asked for the links to other events, so they’re able to bid on items from different chapter events as theirs is happening. “Being able to keep an eye on all events from my office or home using OneCause has created valuable opportunities for CCA,” said Askin.